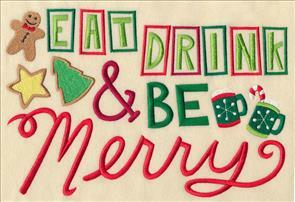 Make spirits merry and bright with new Christmas whimsy designs! 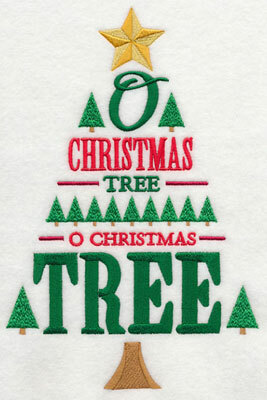 Holiday phrases and lyrics from classic carols are in the shapes of Christmas trees. These designs bring color and charm to tea towels, stockings, and framed pieces. 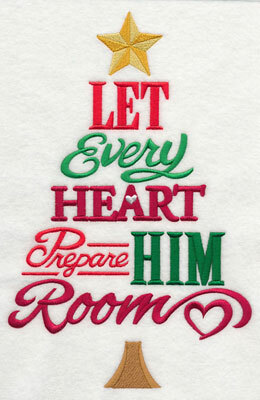 Santa's code of conduct will help you keep the spirit of Christmas in your home and in your heart. 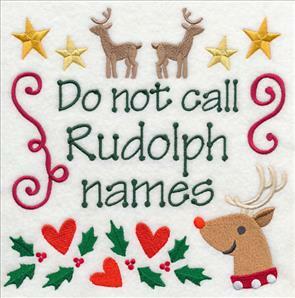 Rules like "Be more nice than naughty" and "We do not call Rudolph names" are fun on wall hangings and pillows. 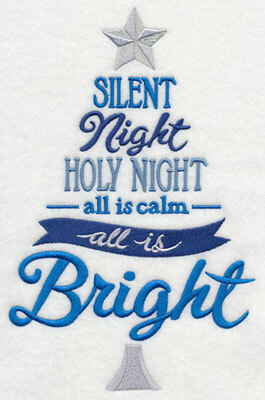 Holly-jolly quotes are sure to bring giggles and grins from shirt fronts, placemats, and fleece blankets. 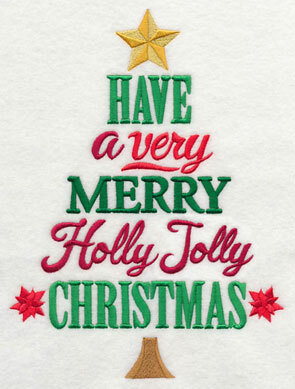 They're colorful and clever, and a fantastic addition to your Christmas gifts and decor! Scroll down the page to see these designs! 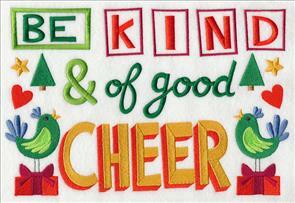 Add a fun and festive look to your home with these new designs! 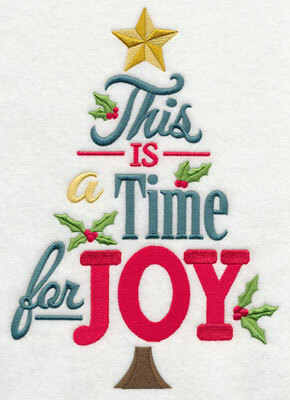 Spirited sentiments take shape in classic Christmas tree designs. 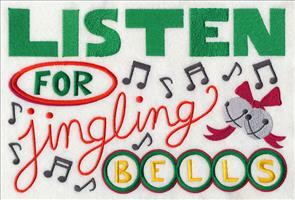 Stitch bright and festive sayings onto pillow covers, tea towels, and they'll be very merry additions to tree skirts, too. 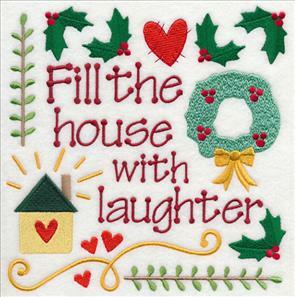 5.78" x 9.01" and 5.00" x 7.80" and 4.40" x 6.85"
Holly-jolly quotes are sure to bring giggles and grins. 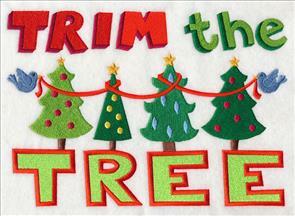 The tree shape is perfect for stockings, wine bags, and tea towels. 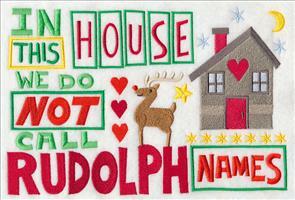 6.79" x 9.00" and 5.88" x 7.80" and 4.85" x 6.43"
Make your home warm and cozy this Christmas. 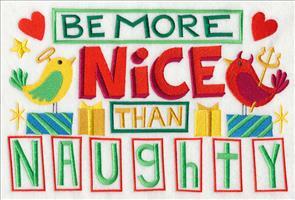 Stitch these joyful designs onto mantle runners, pillow covers, tree skirts, and stockings; they're words to live by this holiday season. 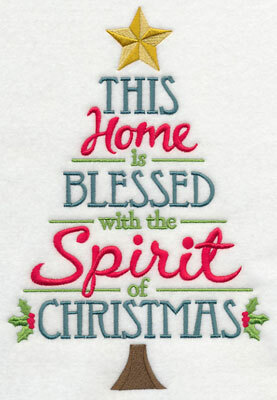 5.98" x 9.01" and 5.17" x 7.80" and 4.55" x 6.85"
Celebrate the spirit of the season by stitching these inspirational phrases onto your home decor. 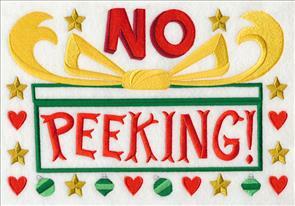 These designs bring color and charm to tea towels, stockings, and framed pieces. 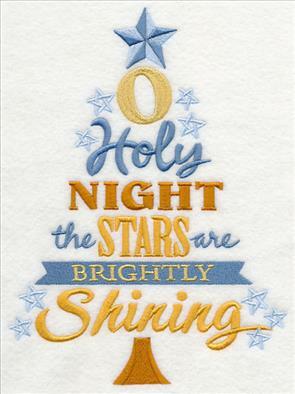 6.42" x 9.26" and 5.42" x 7.81" and 4.71" x 6.79"
Words from beloved Christmas songs make a fantastic addition to your Christmas gifts and decor. 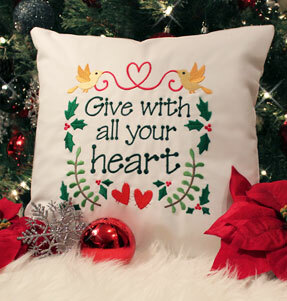 These beautiful designs will bring a holly and jolly spirit to your home this winter season. 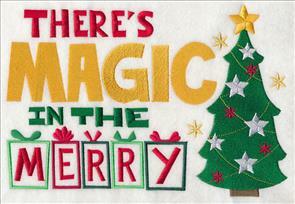 6.17" x 9.26" and 5.21" x 7.81" and 4.57" x 6.85"
Add festive flair to your garments and gifts with these Christmas phrases. 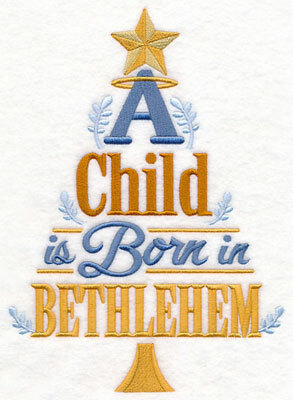 The classic tree shape adds a unique and artful touch. 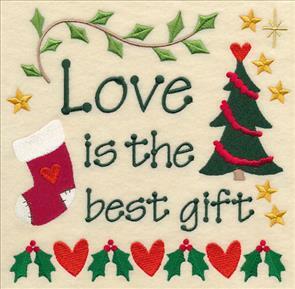 Beautiful on table linens, pillow covers, and wall hangings. 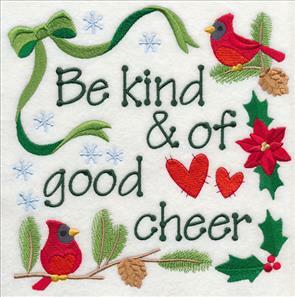 6.09" x 9.26" and 5.14" x 7.81" and 4.50" x 6.83"
These sentiments are filled with Christmas cheer, and will add a spirited note to wall hangings, framed pieces, and tote bags. 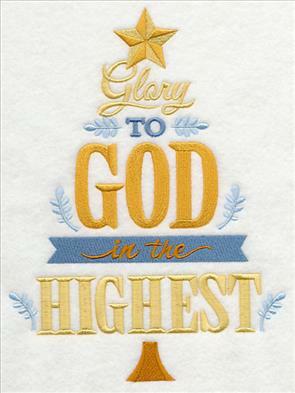 Ministers, pastors, choir directors, and Sunday School teachers will love gifts embellished with these designs. 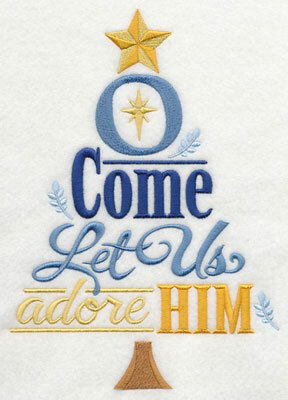 6.91" x 9.21" and 5.86" x 7.81" and 4.86" x 6.48"
Lyrics from classic and beloved hymns are arranged in the shape of a Christmas tree. 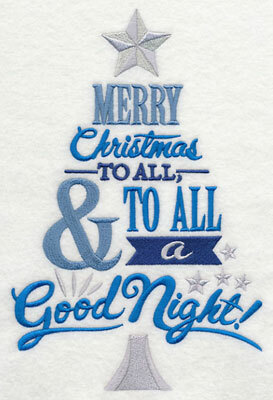 We used blue and silver, reminiscent of a starry Christmas Eve. Experiment with color schemes to match your personal preference and taste. 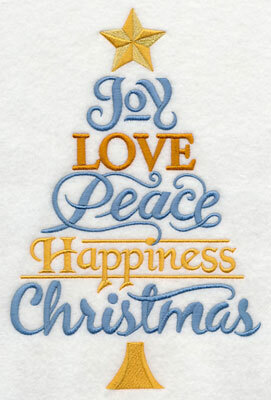 6.11" x 9.26" and 5.15" x 7.81" and 4.51" x 6.83"
A variety of interesting lettering styles adds a unique touch to your holiday gifts and decor. 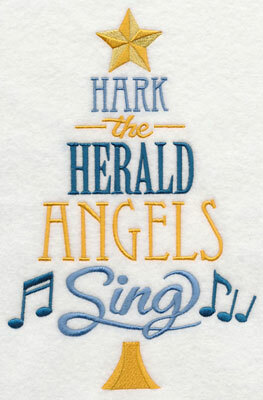 Hum favorite Christmas carols and hymns while stitching these designs. 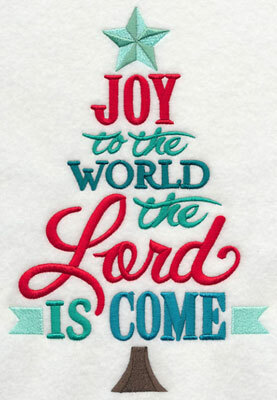 6.91" x 9.19" and 5.86" x 7.81" and 4.89" x 6.51"
Christmas is a joyful and triumphant time as we celebrate with family and friends. 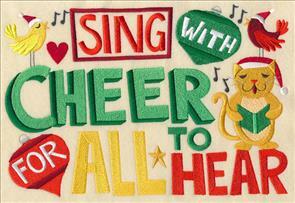 Phrases from hymns and Bible verses let you show your holiday spirit with creative stitches. 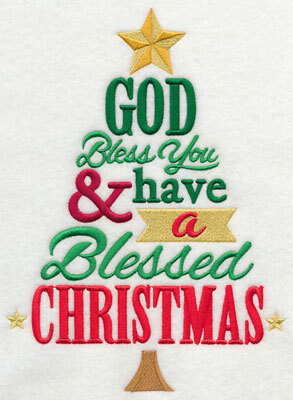 6.16" x 9.26" and 5.21" x 7.83" and 4.58" x 6.88"
Let the light of Christmas glow in your hearts! 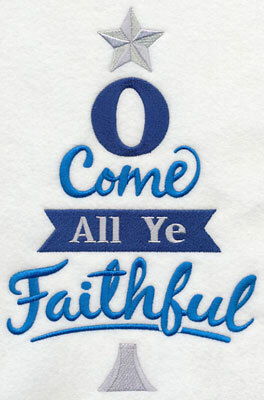 Pastors, ministers, priests, and deacons will cherish gifts made with these designs. 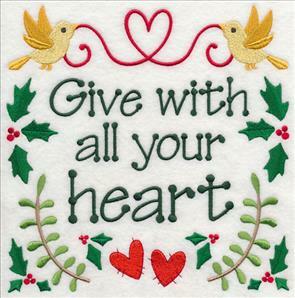 Stitch them and give as gifts, or hang in your place of worship for all to enjoy. 6.24" x 9.25" and 5.26" x 7.81" and 4.62" x 6.85"
The last line from the beloved poem, A Visit from St. Nicholas, is in the shape of a Christmas tree. 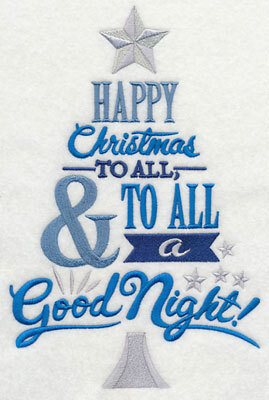 Two versions are available - Merry and Happy - depending on your preference. Add to fleece blankets for a warm and cozy look. 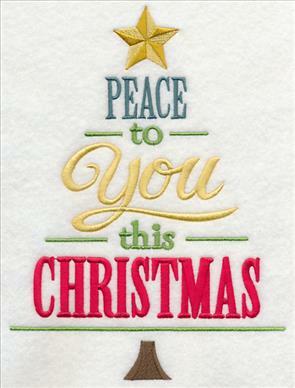 6.01" x 9.01" and 5.21" x 7.80" and 4.55" x 6.81"
This positive message of peace, in the shape of a Christmas tree, is a beautiful addition to your holiday projects. 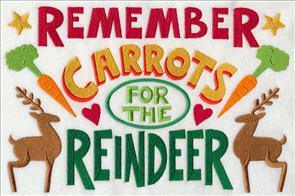 Stitch it on tea towels, table linens, gift bags, and stockings, too. 6.07" x 9.26" and 5.11" x 7.79" and 4.50" x 6.85"
Santa knows that the best way to keep holiday spirit in our hearts is to follow his Christmas Code. 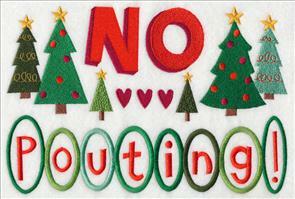 The rules are spelled out in the designs below, paired with colorful and festive imagery. 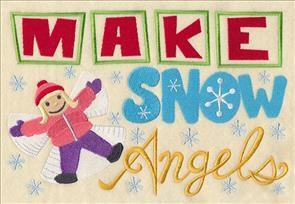 Add these designs to pillows, blankets, tree skirts, and wall hangings, to spread Christmas cheer. 7.81" x 7.72" and 6.99" x 6.91"
5.93" x 5.86" and 4.83" x 4.76"
7.49" x 7.80" and 6.90" x 7.19"
5.85" x 6.09" and 4.81" x 5.01"
Add these messages to pillow covers, tree skirts, and mantle runners, and have daily reminders of the sweet and loving spirit of Christmas. 7.77" x 7.80" and 6.86" x 6.88"
5.84" x 5.86" and 4.86" x 4.87"
7.81" x 7.65" and 7.06" x 6.91"
5.99" x 5.86" and 4.96" x 4.86"
Christmas is the perfect time to let your love grow. 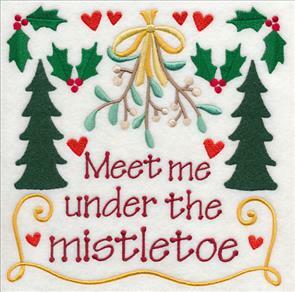 And, be sure to sneak a smooch under the mistletoe! 7.81" x 7.52" and 7.16" x 6.90"
5.96" x 5.81" and 4.89" x 4.78"
7.80" x 7.77" and 6.90" x 6.88"
5.85" x 5.83" and 4.84" x 4.83"
Stitch sweet holiday sentiments on tree skirts, stockings, and quilt squares to fill your home with laughter and cheer. 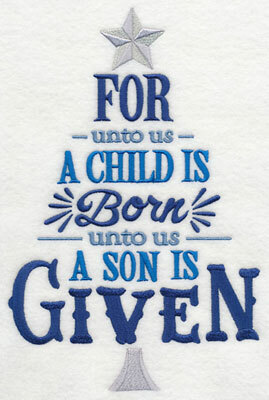 Use several of these designs in a wall hanging, series of framed pieces, or on several throw pillows for a festive effect. 7.66" x 7.80" and 6.90" x 7.02"
5.86" x 5.96" and 4.85" x 4.93"
7.80" x 7.81" and 6.91" x 6.92"
5.86" x 5.87" and 4.81" x 4.81"
Christmas in the kitchen is the sweetest place on earth. 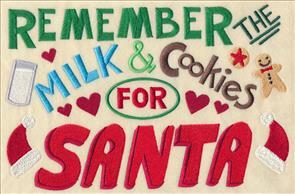 Gingerbread, milk, and cookies are set out for Santa. These designs are delicious additions to aprons, placemats, and tea towels. 7.81" x 7.50" and 7.20" x 6.91"
6.11" x 5.86" and 5.01" x 4.81"
7.62" x 7.81" and 6.88" x 7.06"
5.85" x 6.00" and 4.85" x 4.98"
Santa's rules and reminders are colorful, creative, and filled with Christmas charm! 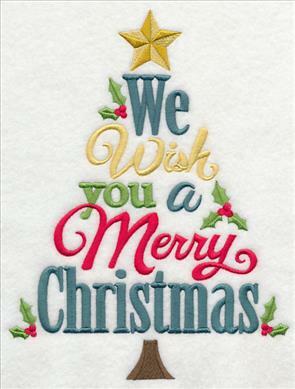 They're sure make spirits bright - and if followed closely, more boys and girls will find themselves on the "good" list. 7.80" x 7.73" and 7.00" x 6.93"
5.93" x 5.89" and 4.84" x 4.81"
7.80" x 7.82" and 6.90" x 6.91"
5.85" x 5.86" and 4.80" x 4.80"
Santa's Christmas Code lets you stitch holiday spirit on all of your gifts and decorations. These designs are a perfect fit for pillows, placemats, towels, and table linens, too! Order the designs singly by using the links above. Or, get all 12 in a design pack! 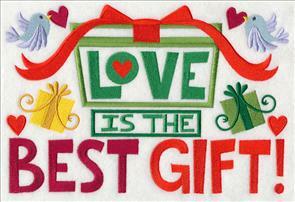 **XXL - Designs smaller than 7.9" x 7.9"
Bright and colorful phrases are paired with classic images in these designs. They add a bit of whimsy to garments and decor! Add them to shirts, fleece blankets, and wall hangings. 10.29" x 6.90" and 8.74" x 5.86"
10.55" x 6.91" and 8.94" x 5.86"
7.80" x 5.11" and 6.86" x 4.50"
Dress up table linens, aprons, and placemats with these colorful and festive designs. 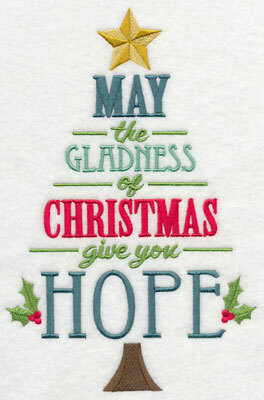 We embroidered the samples in classic Christmas tones - but experiment with different palettes to suit your project needs. 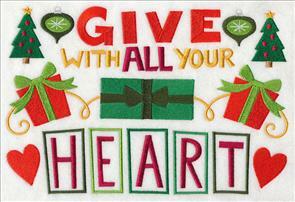 10.39" x 6.91" and 8.81" x 5.86"
10.23" x 6.90" and 8.68" x 5.85"
7.79" x 5.26" and 6.84" x 4.62"
Bring cheerful and loving messages to your holiday gifts! The rectangular shape of these designs makes them a perfect fit for towels, tote bags, placemats, and aprons. 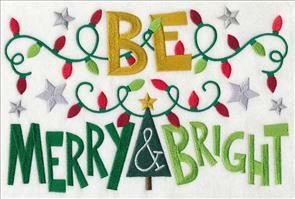 10.42" x 6.90" and 8.84" x 5.86"
10.18" x 6.90" and 8.63" x 5.85"
7.83" x 5.30" and 6.86" x 4.65"
Embroider these delightful messages onto blankets, pullovers, wall hangings, and mini-quilts! 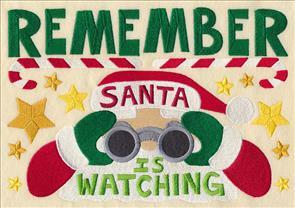 10.41" x 6.90" and 8.83" x 5.86"
10.30" x 6.92" and 8.74" x 5.87"
7.79" x 5.24" and 6.86" x 4.61"
Santa wishes everyone a jolly holiday - and elves hug under the mistletoe. 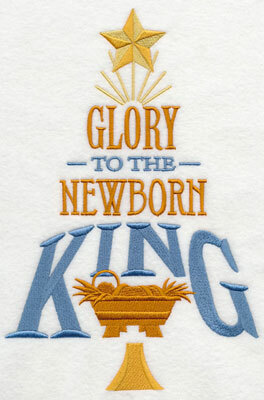 These designs are sure to bring smiles from shirts and towel sets! 10.16" x 6.89" and 8.64" x 5.86"
10.44" x 6.91" and 8.85" x 5.86"
7.80" x 5.16" and 6.86" x 4.54"
Take time during the Christmas season to stop and smell the cookies - but be sure not to count those calories! 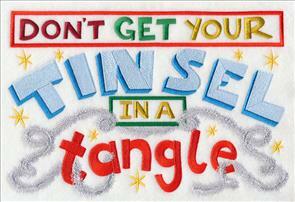 And, during the hustle and bustle of the holiday, don't get your tinsel in a tangle. 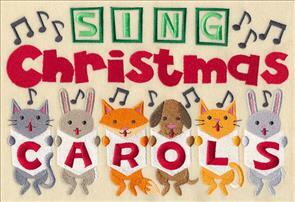 10.58" x 6.89" and 8.99" x 5.86"
10.38" x 6.88" and 8.80" x 5.84"
7.79" x 5.18" and 6.86" x 4.57"
The sounds of jingle bells and Christmas carols can make the spirit grow! 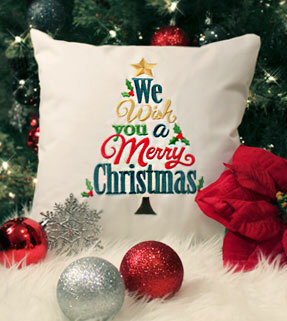 These festive designs add a very merry melody to pillows, blankets, and wall hangings. 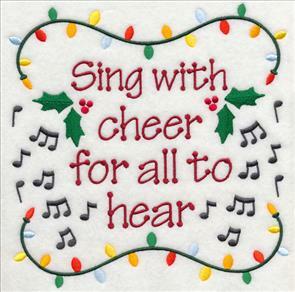 Choir directors and music teachers will enjoy gifts made with these designs. 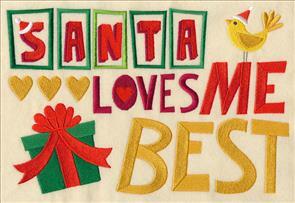 10.24" x 6.91" and 8.68" x 5.86"
10.18" x 6.85" and 8.69" x 5.85"
7.81" x 5.26" and 6.86" x 4.62"
Stitch "Santa Loves Me Best" on a sweatshirt to advertise your top spot. 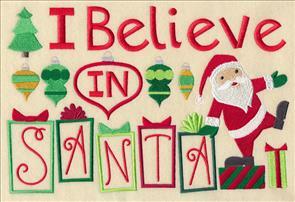 And, dress up placemats, mug rugs, and more with "Believe in Santa" designs. 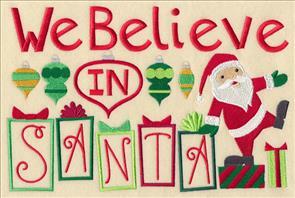 10.31" x 6.90" and 8.75" x 5.86"
10.35" x 6.87" and 8.80" x 5.84"
7.81" x 5.18" and 6.83" x 4.53"
"Believe in Santa" is shown above, and we're pleased to offer other variations as well. 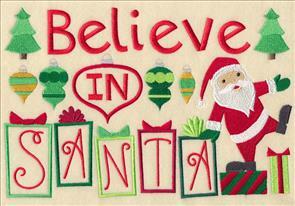 "I Believe in Santa" and "We Believe in Santa" versions are also available. 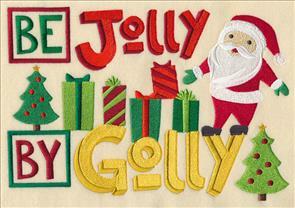 The Jolly Old Elf dances among colorful gifts and ornaments. 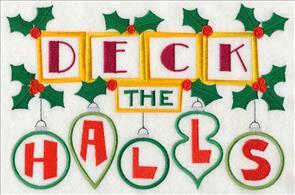 10.35" x 6.89" and 8.80" x 5.86"
10.35" x 6.83" and 8.80" x 5.83"
7.81" x 5.20" and 6.83" x 4.56"
Deck the halls for the holidays! 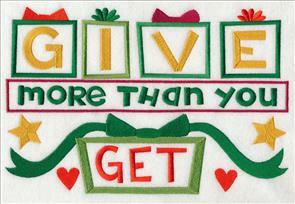 These designs are wonderful on mini-quilts and wall hangings. 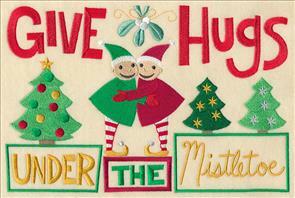 They bring dashes and splashes of Christmas colors to your home. 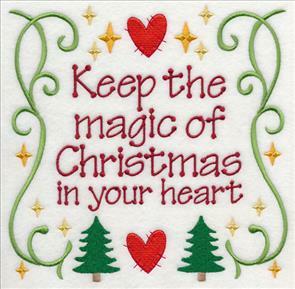 10.32" x 6.92" and 8.76" x 5.87"
9.86" x 6.90" and 8.38" x 5.86"
7.80" x 5.45" and 6.86" x 4.80"
Christmas rules include "No Pouting," and "No Peeking!" 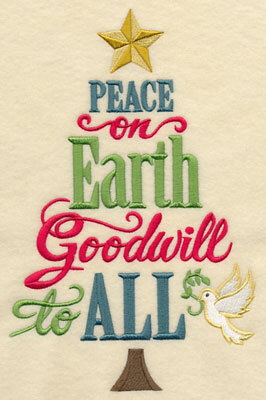 Encourage the best behavior at your family gatherings with these light-hearted designs. 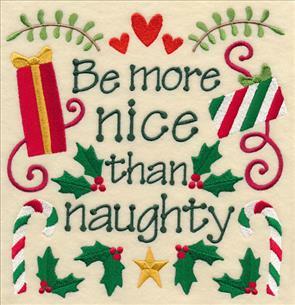 10.24" x 6.89" and 8.71" x 5.86"
7.79" x 5.24" and 6.86" x 4.62"
Santa encourages good behavior - and that includes being more nice than naughty, and being kind to Rudolph as well. 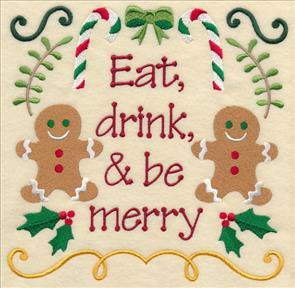 Add these designs to wall hangings, cushion covers, and tea towels - they're a perfect blend of Christmas spirit and words of whimsy. 10.57" x 6.91" and 8.97" x 5.86"
10.22" x 6.86" and 8.73" x 5.86"
7.81" x 5.24" and 6.86" x 4.61"
Reindeer silhouettes leap among hearts and stars. 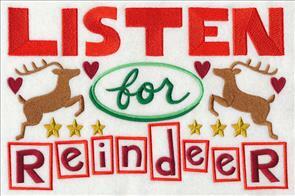 Remember to listen for them (and the sound of jingle bells) on Christmas Eve! 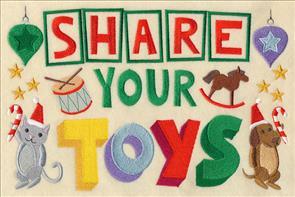 And, be sure to share your toys with the other children, too. 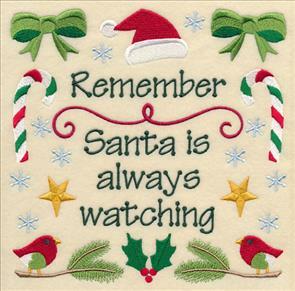 Santa knows when you've been bad or good, so be good for goodness' sake. 10.52" x 6.92" and 8.92" x 5.87"
10.45" x 6.91" and 8.87" x 5.85"
7.83" x 5.18" and 6.86" x 4.53"
Winter is a time to frolic in the snowflakes! These designs are cozy additions to sweatshirts and fleece blankets, too. 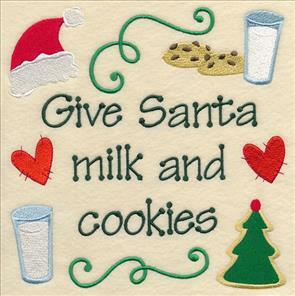 10.34" x 6.91" and 8.76" x 5.86"
7.81" x 5.23" and 6.86" x 4.59"
Santa and his team are fueled by milk, cookies, and carrots. 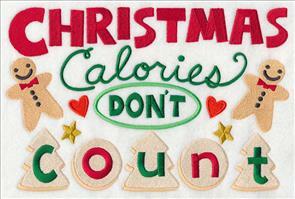 Stitch these sweet reminders onto placemats and table runners for snacks on Christmas Eve. 10.62" x 6.91" and 9.00" x 5.86"
10.53" x 6.90" and 8.92" x 5.85"
7.79" x 5.11" and 6.85" x 4.49"
Friends and family will love Santa peering through his binoculars. 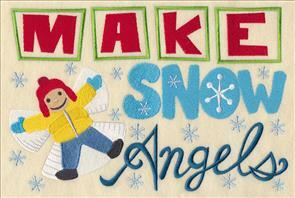 Make a wall hanging with a pocket for a wish list (or, notes on good behavior!). 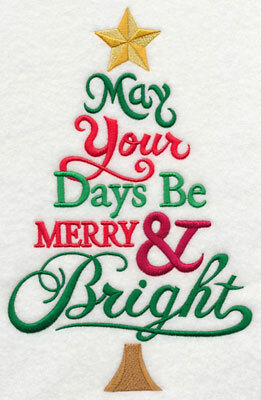 And, it's colorful and fun on shirts and holiday apparel. 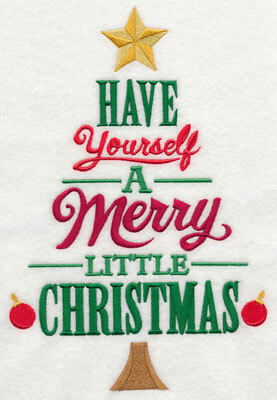 9.98" x 6.91" and 8.46" x 5.86"
7.80" x 5.40" and 6.85" x 4.74"
Enjoy adding Christmas color and whimsy to your home this holiday season!